The first time we went to Langkawi, we went to have a holiday and relaxing time with our family while exploring more of Malaysia. Langkawi delivered! 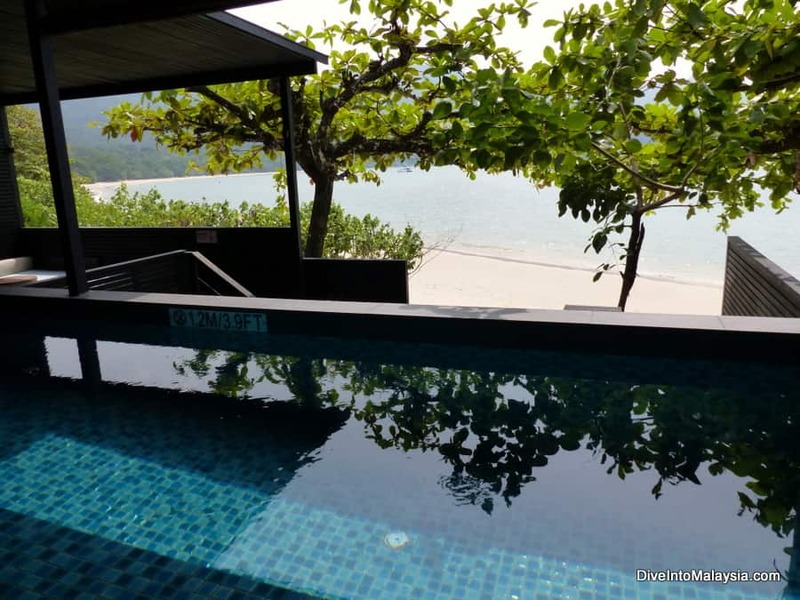 Then we moved on to our final hotel, The Andaman A Luxury Collection Resort, Langkawi, Malaysia in our final few days and the holiday went up another ten notches. The Andaman Langkawi is one of the most beautiful resorts anywhere with luxurious rooms, fabulous facilities and the best setting possible. 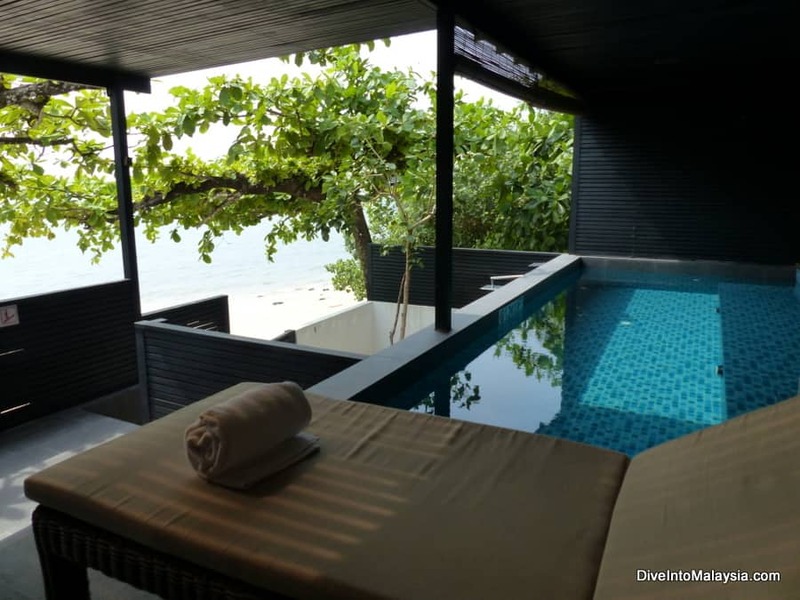 Whether you are looking for a honeymoon spot or a family holiday, like us, I describe everything we found in the following The Andaman Langkawi review in our Andaman Langkawi blog. The Andaman Langkawi is located in the north-west of Langkawi. It is on its own private bay along The Datai and the location is just stunning – it’s really built between the trees of a 10-million-year-old rainforest and the Andaman beach Langkawi. The resort has been built into the rainforest and surrounding hills and it does feel like you are part of the rainforest rather than being in a big resort. It’s well done and it’s beautiful. This does mean that ocean views often give way to rainforest views as there isn’t a ton of development along the beach but this really does add to the appeal of the whole resort. The resort is on its own beach with The Datai and it’s a gorgeous, clean beach. We enjoyed hanging out here very much although it was hard to leave our private pool. More about this below. Of course, this does have the drawback that you are a drive from other activities and eating options so if you are someone who likes to be in the thick of things, this isn’t the right place for you (find more options here). However, if luxury on a tropical island where you can feel away from it all but can also easily leave and see more if you wish is what you want, The Andaman Langkawi could be perfect for you! Langkawi airport to Andaman is still not far and you will love your stay here. There are a huge range of room types at The Andaman for every preference and budget. 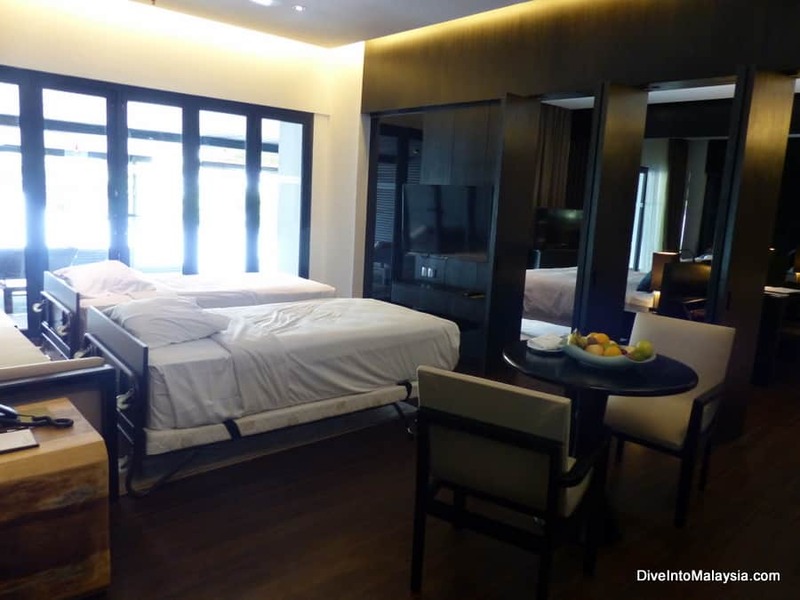 Even the simplest rooms are far from simple, and they are exactly what you would expect from a top 5-star hotel. You’ll have a beautifully furnished room no matter what you pick. Everyone gets access to a turndown service, 24-hour room service and a room where dark wood details are the focus with nature inspired artwork. You also have a 32” LCD television with DVD player for when you want to take it easy and a coffee pot. You can then clean up with a large bathtub and a separate rainforest shower. Gowns and slippers are also provided. For the best experience, I recommend one of the private pool or Jacuzzi options. Below is further information about our executive pool suite room. We stayed in an executive pool suite which is like a massive one bedroom apartment with its own pool right by the beach. It is amazing! The suite has two rooms and 1.5 bathrooms. The living area is big with plenty of room for two single beds if you are travelling with kids. The bedroom is big with a king sized-bed and plenty of room. The bathroom is huge with a big bath tub and twin vanities. Everything is well appointed with a great range of quality toiletries, gowns, a mini bar, plenty of bottled water and more including a giant bowl of fruit. The turndown service is also great and it was lovely to return to our room after dinner to find water and slippers next to our beds. However, the inside was nothing compared to our fabulous outside terrace area. This room type has a decent sized private pool, lounge area, day bed and an outdoor shower. We had direct beach access from the gate (but note mostly this is not the case with this room type but you’ll still only be a minute’s walk from the beach). It is incredibly hard to leave this area – we loved it! I think even if the rest of our Andaman resort Langkawi review hadn’t been outstanding (which it is! ), this room alone would have been worth the stay. This resort has an amazing array of activities – assuming you are able to drag yourself away from your room or the beach! There is a large pool complete with water slide which is lots of fun. The surrounding rainforest ensures there is a lot of shade and there are rainforest walks and rainforest activities to get the most of the location. One of the best facilities in this resort is the coral nursery. The natural coral reef in front of The Andaman Luxury Resort Langkawi was badly damaged during the 2004 Boxing Day Tsunami. In fact, this reef helped protect the resort and its occupants as it absorbed and slowed down the impact from the waves. The Andaman started their coral nursery to help restore this reef. They grow new coral within the resort and transplant it back to the sea. This endeavour is fabulous for guests not just because of the coral reef restoration but because they give guests the opportunity to learn more about coral reefs and to get up close to the coral. There are many activities designed for guests at their nursery. Our 4 year-old was able to have a private snorkelling tour of the coral nursery. Other facilities include a gym, the Andaman Langkawi spa and gift stop. If you are travelling with kids, you will LOVE the Young Explorers Club (kids club). This is a very well run kids club where the kids get out and about exploring areas of the resort. Our kids also did activities like make nature collages, painting and going on a monkey hunt. The kids club is for ages 4+, but you can take younger kids if you stay with them or do what we did and hire a babysitter to accompany them. There is also an activity program around the resort for adults so you only will be bored if you want to be. There are four restaurants at The Andaman as well as a bar and a lounge. We managed to eat at most of them and they are all top rate which is lucky as you are somewhat stuck eating here for many meals. There is a Japanese restaurant, a seafood Andaman Langkawi restaurant and two international restaurants with a range of food so you are sure to find something familiar. The seafood restaurant, Jala, is particularly good and you can chose your own fish. It’s located right by the beach and you can chose how your fish will be cooked and what sauces and sides you want. 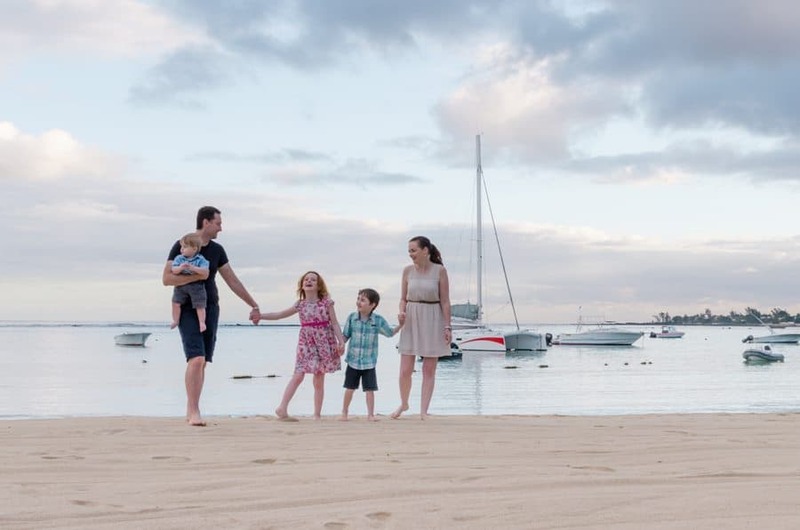 Eating beachfront is also both beautiful and handy if you have kids – our kids could play while we relaxed with a sundowner. For vegetarians, like me, the menus are clearly labelled with appropriate choices and there is a whole vegetarian corner at breakfast. There is always a kids menu as well. 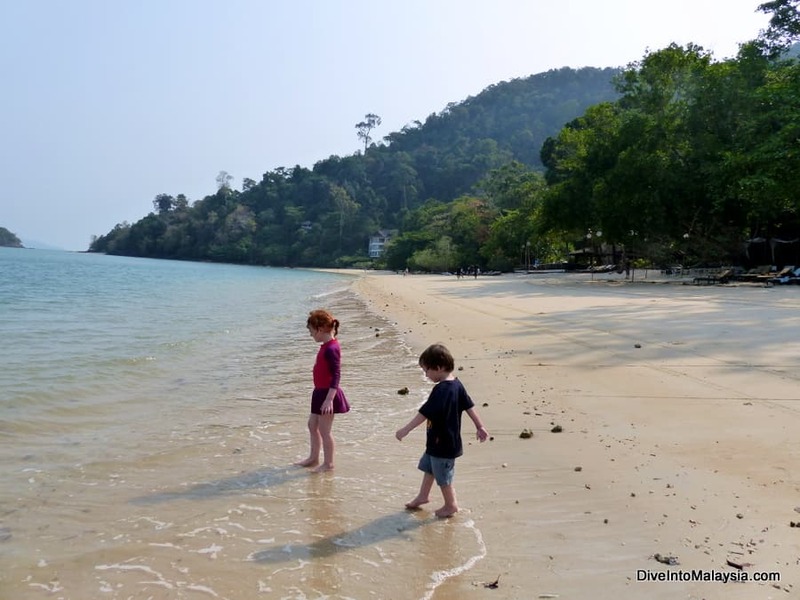 We visited The Andaman Resort Langkawi with kids and we highly recommend it. This is a great choice with kids. The resort is spaced out with so much space to run around, the beach is right there, there is a big pool with water slide, the kids club is fantastic… The list goes on and on! The kids really loved the kids club and our own pool. It’s perfect. I also loved the attention the staff paid. Our three year old decided to go wash his hands at a restaurant without us realising immediately. A staff member saw what was happening and helped him out. In case you can’t tell already, The Andaman is a fabulous hotel and Andaman luxury Langkawi can’t be beat. We loved the setting – the beach and the rainforest, the facilities – especially the coral nursery and the Young Explorers Club – and our room – the pool suite is excellent! The food is also top rate and I’d love to eat at the seafood restaurant every night! The Andaman, A Luxury Collection Resort Langkawi reviews always talk about these things and they are right. This resort does a great job of providing an amazing experience in a secluded spot. My only complaint is also part of what I loved about the place –that it is secluded. It’s away from it all and far enough away that it’s hard to be bothered to venture out much. So this resort is best for you if you want a resort that has everything you need without venturing away and love to be surrounded by beauty. Don’t think The Andaman is quite right for you? Find more Langkawi resorts with private pool options by clicking here. Best Resort In Redang Island: Top 7 Best Options!